James got into physiotherapy through his experiences as a keen amateur sportsman. Having endured his share of football-related injuries, he became interested in the anatomy and physiology of the body and how an understanding of this could help people recover from injury and pain. James graduated from Teesside University with a first class honours degree in physiotherapy in 2001 having already completed an undergraduate degree in sports Science. On graduating James entered the world of Professional football, first as academy physiotherapist with Newcastle United and later as head of medical for the first teams at Hartlepool United and Huddersfield Town. He went on to join the first team staff at Arsenal in 2015. After three years with Arsenal, James now works with another premier league club (although we can’t say who) as well as the Welsh national football team. James has also broadened his experience and expertise by working in a number of private clinics over the years, as well as by supporting athletes from a variety of disciplines through the English Institute of Sport system. James has a keen interest in the management of sports injuries, and in particular returning both professional and recreational athletes back to their desired level of sporting performance, whether that be from injury or surgery. 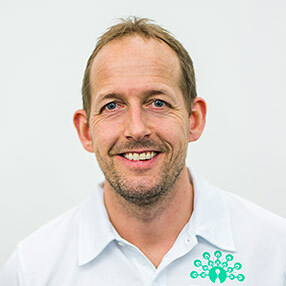 James also has a strong background in manual therapy and clinical diagnosis from his post graduate training and enjoys utilising an individually tailored combination of hands on therapy and exercise prescription (not to mention a breadth of clinical experience) to help patients from all walks of life eliminate pain and return to – or improve – their previous level of function. When not working or studying (James is a committed life-long learner), James enjoys keeping fit, staying injury–free and spending time with his family.